Carte de la Retraite des Dix Mille, pour servir a l'Histoire de la Grece. 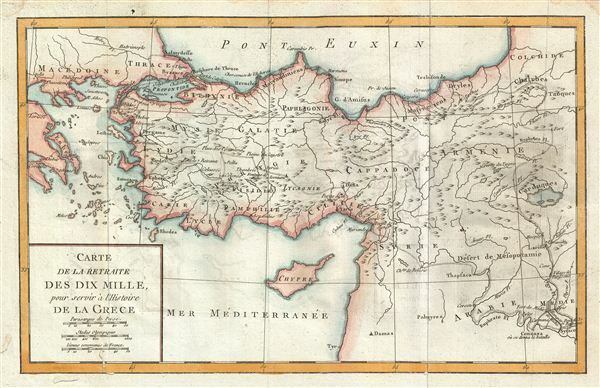 This is a fascinating example of the 1770 Jean-Baptiste-Claude Delisle de Sales' map of Turkey illustrating the historic Retreat of the Ten Thousand Greeks. This map was drawn as a record of the History of Greece. From 401 BC and 399 BC, a group of ten thousand Greek mercenaries marched to the battle of Cunaxa (Connaxa). The mercenaries, under the command of Cyrus the Younger, hoped to unseat the Persian king Artaxerxes II in favor of Cyrus. The Greeks marched from the Agaean coast inland as far as Mesopotamia where the forces of Artaxerxes II were crushed. The military victory however, proved pointless as Cyrus himself was slain in the battle. Several important cities, rivers, mountains and other topographical details are noted. This map was issued as part of Delisle de Sales' Histoire des hommes. Partie de l'Histoire Ancienne. Becasue most of Sales' work was burnt under the censorship of heresy, this volume is exceedingly rare. Very good. Blank on verso. Minor wear along original centerfold. Some offsetting. Minor damage near lower left border. Professionally flattened and backed with archival tissue.